The first multi-storey residential complex under Future Estate’s $450M development pipeline has now been completed. Highgate Management delivered Development and Project Management services to Future Estate Group Pty Ltd for the delivery of their residential construction projects since 2011. ‘Riviera Mackay’ is the largest facility completed so far and comprises 64 premier riverfront apartments targeted towards the short term accommodation market. 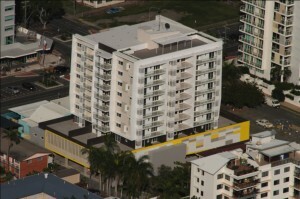 ‘Riviera Mackay’ is located adjacent to the Pioneer River and offers stunning views over the river from many of the 64 x 1 and 2 bedroom apartments. The apartments feature high quality finishes throughout with spacious open plan living areas, private balconies, fiber connectivity (NBN) and a communal rooftop terrace. The development is located only 200m from the CBD and 300m from Caneland Shopping Centre with many cafes, pools, restaurants and schools nearby. Construction was completed in July 2015. Settlements of sales were completed in September 2015 with operations commencing in October 2015.